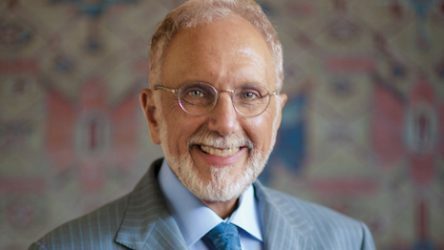 Press / Luxury Daily / Claremont Rug Company’s Jan David Winitz Discusses Building Lasting Relationships with Clients – New! 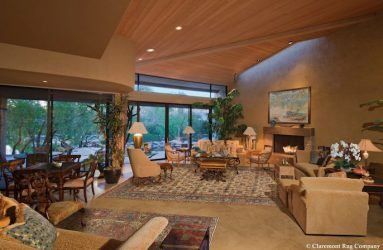 Claremont Rug Company’s Jan David Winitz Discusses Building Lasting Relationships with Clients – New! This article originally appeared in a column entitled “How I Did It: Claremont Rug Company’s Jan David Winitz” in Luxury Daily. For nearly four decades I have had the privilege of selling precious tangible assets to an ultra-high-net-worth clientele. From an initial collection of 40 rugs, the inventory at Claremont Rug Company has expanded to more than 3,500 fine antique rugs. From a client base of a few dozen in the San Francisco Bay Area, our clientele now resides on five continents and includes more than 75 Forbes’ list billionaires. A Claremont Rug Company client’s great room. We have achieved this level of success with minimal advertising and no participation in outside trade shows or exhibitions. How? I believe that is it based on two core principles that I identified on day one and have maintained since cofounding the gallery with my wife, Christine, in 1980. What this means on a practical level is that our customer service begins at the first client interaction, not when a transaction takes place. While our goal is to sell rugs, which are valued in the $20,000 to more than $500,000 per piece range, our immediate objective is to build lasting relationships with potential clients. Rare Persian Bakshaish (8-2 x 10-10), woven ca. 1875, with a “Garden of Paradise” design in undyed camel hair. When we opened Claremont, many of the obstacles we faced involved the perception of “rug dealers” and how they sold rugs. Our vision was unique: we recognized that the best antique Oriental rugs were undervalued in comparison to works of art such as oil paintings, sculpture and furniture of similar provenance and aesthetic achievement. We committed ourselves to obtaining and to selling only those pieces we considered art and investment level. Early on, we also understood that the process of working with highly affluent clients depends on gaining their trust and confidence and in our expertise about what we offer. We also learned that developing this level of trust would lead to long-term relationships and repeat purchases. 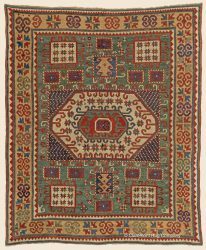 A Caucasian Karachov Kazak (5-8 x 6-10) from the third quarter of the 19th century. Highlighted by unusual colors, including a rarely used apple green field. Concurrently, Harvard Business School confirmed what was described as the lifetime value of a customer in a case study that demonstrated that long-term clients should be coveted and are key to building a successful business. The strength of our company is a perfect proof point of this concept. We actively listen to the client from the first moment of contact. We view all client interactions as a continuing process of discovery where we gather insights into how they think and what they value. We engage our clients in an educational process, which becomes the basis of our relationship and which is how we satisfy their needs. We treat every client as an individual and create a personalized program to satisfy his or her particular needs and interests. Ours is an anticipatory approach based on the presumption that those who we serve deserve a level of service at the highest level possible. We believe strongly that “Client First” is the differentiator that sets our gallery apart, providing the foundation for ongoing success. I have many clients who have acquired hundreds of rugs from the gallery over several decades, investing hundreds of thousands to millions of dollars in their purchases. I have clients who have acquired one-in-the-world collections in a brief period of time. However, what they spend is ancillary to what they have in common: a confidence that we will present to them only the finest examples extant of the genres of rugs that interest them. Because client education is a prime factor in our relationship, they come to develop a high degree of confidence about what they are purchasing. I have helped them, exclusively, to build important and extremely valuable private art collections of rare rugs that are quite literally the equivalent of investment portfolios. Of course, offering price/value is a component in any transaction, but to reach this pinnacle of success is a combination of a vast, continually changing inventory, great product knowledge, personal responsiveness to the client’s needs and a respect for and an understanding that our clients are used to obtaining what they desire. 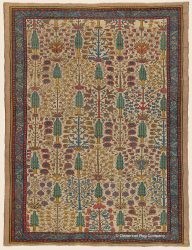 In the most famous Persian city style, this Motasham Kashan (4-6 x 6-6), woven a rare Vase design, was produced in the third quarter of the 19th century. 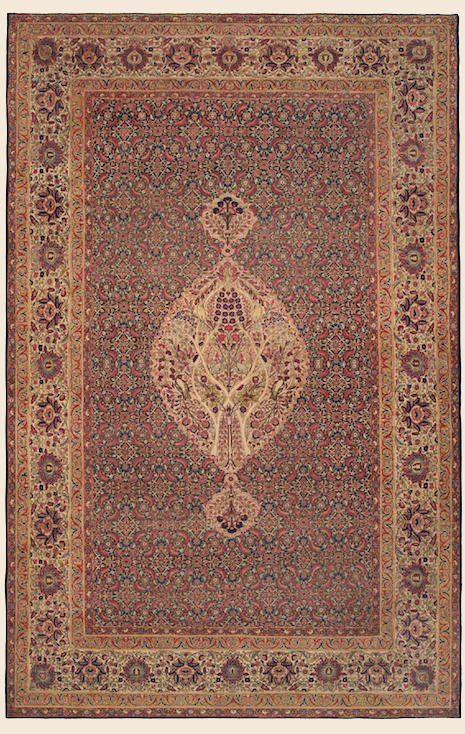 The traditional approach in the antique rug world has, for the most part, been transactional. Not so with us. Our 100 employees and unique international buyer/collector team are key factors to our success. Our one location – Oakland, CA – is not situated in an arts/antiques enclave. I have not participated in an off-site event since 1985. But we were an early adopter of the Internet, having been introduced to it by a client, the cofounder of Adobe, in the 1990s. Now, more than 70 percent of transactions involve the Internet. Over the years, we have adhered to our principles because we believe in them and because they work. While our technology has progressed with the times, our personal commitment to “Client First” has not wavered. A challenge that we now face is the ever-dwindling supply of antique Oriental rugs that meet the criteria for collectors and connoisseurs. To counteract this, we have expanded the reach of our buying team. Concurrently, to ensure that our inventory continues to be one-in-the-world, we have redoubled our efforts to acquire private collections held by individuals and families, leveraging our international network of buyer/collectors. We also continue to expand our educational efforts, frequently adding new articles that I have written and posted to the education section of our Web site. We are adding video as an important tool to provide additional information about how to view and to select rugs. 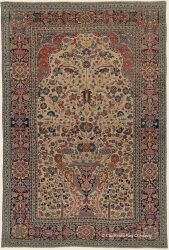 This Persian room-size Kermanshah (11-7 x 17-10) likely took a team of six weavers over three years to hand loom during the mid-19th century.  In the end, however, I trust fully that our continuing success will be built on “Client First,” which includes making house calls anywhere in the United States, offering first-rate restoration services and a long-term exchange policy. I work on whole home projects, personally working with clients to furnish a single residence or several homes with antique rugs that unify an interior design or help expand a personal design motif. As we have evolved from a small gallery with a modest collection to one with an international reputation and clientele, we have continued to look for ways to exceed the expectations of an audience that is used to obtaining what it desires. We believe that, coupled with our expertise and inventory, “Client First” is the means to the greatest possible success, and that education is the vehicle that allows us to provide our clients with art objects that continually satisfy their desires. Jan David Winitz is founder and president of Claremont Rug Company, Oakland, CA. Reach him at jwinitz@claremontrug.com.